This maybe one of those times where even though a product has a tone of great user reviews – you might want to stay clear unless you are absolutely sure you like the sound. Unique and good looking shape. Single Driver means no cheap cross over. Minimal Bass and Distorts at high volume. Needs power outlet – not USB powered. Loosless Audio claim is a misnomer. These little Cubik speakers use a 2.5-inch metal-cone high-end Danish-designed PeerlessTM full range driver speaker unit, internal amplifier, DAC and rear bass port cabinet design. And while that is impressive, and makes for very clean and even mid-range and highs, the bass is resounding lacking. All reviews say they wish it had a sub or deeper bass. And there is a DSP bass booster but that distorts at higher volumes and reduces mid-range clarity. So it is effectively pointless for modern pop music, hip hop, most rock, metal, and electronic music. As well, for how good looking these are, there are too many cables. Â Three in fact. Â Which seems like two too many. Â USB can transfer power as well as data, and needing an extra cable sticking out the back of one to a plug doesn’t look that slick. Â And the long cable from one speaker to the other. Â Just kind of detracts from the whole designÂ experienceÂ of these good looking little speakers. But I think the thing that bothers me most about the Cubiks is the claim or misnomer from their site and Apple’s about the Cubik speakers being “Lossless” audio. Loosless audio refers to the bit quality of the source file. Like if your MP3 or FLAC is anything less than CD quality, than it is loosy. Basically if the music file you are playing from your computer is at a lower bit rate and sample rate than the original CD or DVD audio than it is not ‘lossless’. Â It has nothing to do with the method of transporting data or analog signals. Â A 3.5-mm mini plug is just as high quality a plug as a USB port but they transfer different things. The USB port carries bits of data that will be converted by a Digital to Analog Converter off the computer. The mini-plug uses the computer’s on board DAC before sending the analog signal off through the mini-jack. To claim a higher quality sound because of a “lossless” USB data transfer to an off board DAC is twisting the “lsosless” concept. Â Just as there is a Digital to Analog conversion with the mini-jack there is one in the Cubik too, between the digital amplifier and the analog speaker. I realize this is a bit of a tangent/rant – but audio terminology can be confusing enough as it is. Â So I just want to make it clear. Though the Cubik might sound clean and linear there are cheaper computer speakers out there that on the whole might not be as linear in sonic performance but are still extremely pleasing to both the ear and pocket book. So why buy the Cubik speakers? There are a couple reasons to buy the Cubik speakers. First off, for the frequency range they cover they do a fantastic job at producing a linear sound. That means that the mids aren’t too pumped up, or warm, nor are the highs over bearing and grating. The staging is pretty good on these little things, giving off both a wide stage with ability to deliver precises instrument placement. If you are into Jazz, Classical, Vocal music, or prefer a system with a quieter bass response but a truer to source in the mids and highs than these Cubik speakers are for you. It is hard to get pretty good audio at the $200 price point. That is why most audiophiles spend hundreds, thousands, and hundreds of thousands on their home audio system. Perfect sound reproduction comes at a high price. 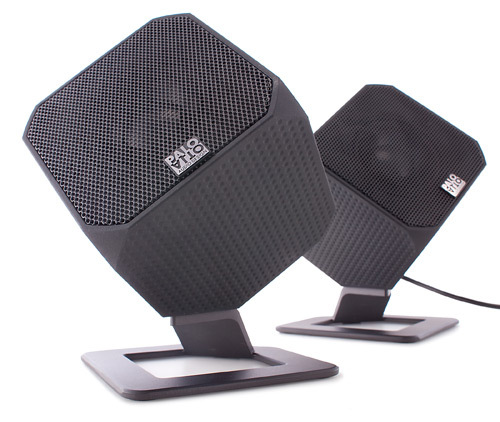 And the Cubik speakers offer a taste of hi-fi at your desk. A quote from your review…. Well, I have a little “tangent/rant” of my own – professional “communicators” who don’t PROOF THEIR COPY!!! The word “looseless” occurs over and over again throughout the copy, the intended word of course being “lossless” – that is, L-O-S-S-L-E-S-S. The substitution of “looseless” for “lossless” is doggedly consistent, so clearly, the “editor” – and I use this term sarcastically – ran the copy through a spell check program and “corrected” an inconsistency in spelling for the whole review by using spell check and by typing in THE WRONG WORD!! Likely – certainly hopefully – if he or she had actually proofread the copy, this ridiculous end result would have been discovered and rectified. Spell check just is no substitute for proofreading, for reasons that should be obvious to anyone, let alone someone who writes for a living. “Looseless” is spelled correctly – at least I guess so, if it really is a word in the English language. But most spell check programs are too stupid to know that the use of “looseless” – whatever the hell it means – is inappropriate for the context. In most cases only an attentive proofreading by a human being – either the writer or his or her editor – can insure that you don’t look like idiots – or worse than that – SLOPPY, which implies that you don’t care about the quality of your work. I would have let all this pass without comment, except for the sanctimonious tone of the reviewer, who is “ranting” about the technically imprecise, outright improper co-opting of the word “looseless” (sic) by Palo Alto Audio Design in their ad copy spinning the praises of their product, the Cubik loudspeaker. The reviewer’s snooty didacticism (seemingly directed more at the reader than at Palo Alto Design…”audio terminology can be confusing” enough, you see. He just wants “to make it clear”) in correcting the manufacturer’s improper use of the term “looseless” (sic) in such a high-handed and arrogant tone while doing so with such sloppy attention to his own detail just makes the reviewer and, by association, AudioReview.com look like asses. Yep you got me on this one! Good catch and thanks for posting. It appears I did let the spell check do too much.